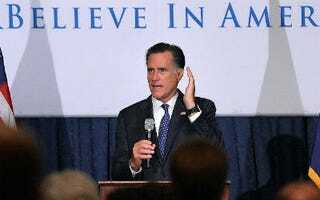 Will Romney Reach out to Racists in Debates? (The Root) — In 2008 something remarkable happened: America elected a black man with a Muslim-sounding name president. The even more remarkable part? That he beat a white war hero from an American military dynasty. But there are plenty of political watchers who believe this turn of events happened only because the war hero was not willing to engage in the political equivalent of nuclear warfare with his opponent. As related in Game Change, the best-selling book about the 2008 presidential election, Republican nominee Sen. John McCain was pressured by his campaign advisers to exploit the controversy surrounding comments by then-Sen. Barack Obama's longtime pastor, Rev. Jeremiah Wright. As told in the book, McCain — still haunted by some of the negative campaigning invoking his foreign-born, adopted daughter during the bruising 2000 GOP primary, in which he was eventually beaten by George W. Bush — eschewed their advice. The rest, as they say, is history. There remain conservatives who believe that if McCain had just been willing to "go there" so to speak, he might have won. Some of those very same conservatives have sought to revisit the Rev. Wright controversy this election cycle. The Romney campaign has pointedly rejected reintroducing the Wright controversy into this campaign. But with polls showing his chance for victory in November slipping further from his grasp, one can't help wondering if his advisers are now having the same talk with Romney that McCain's had with him — the talk in which they say, "Look, if you want to win, you've got to fight. You've got to fight dirty, and that means nothing can be off the table — including racial innuendo." This is the same calculation the George H.W. Bush campaign made when it ran what is still considered one of the most racially inflammatory political ads in modern history, in which black convict Willie Horton was used as the ultimate symbol of white America's fear of the scary black man. This is the same calculation the Richard M. Nixon campaign made when it employed its "Southern strategy" to prey upon white Southerners' fears of a changing America — the kind of America that not only gave black Americans the right to vote but could also potentially elect a black president. This is the same Southern strategy that former Republican National Committee Chair Ken Mehlman would stand before the NAACP and apologize for in 2005. Now the Romney campaign finds itself at a crossroads. With just over a month to go before the election, the question becomes: Will he be willing to do what McCain wasn't, in order to win at any cost? Will he give in to the temptation and begin lacing his ads and language with messages to appeal to those who miss the days of the Southern strategy — and the days of a white Republican president? We've already seen him begin flirting with the racially inflammatory line by making a joke about his birth certificate that many saw as a reference to the manufactured controversy surrounding the president's birth. Romney's language in the debates will confirm whether or not he is willing to cross that line in the quest for victory.